Ah Puch is one of the playable Gods in SMITE. Buried beneath the crust of the world descends the cruel hells of torment. The topmost of which are realms of torture and vile inhumanities, home to denizens of darkness and malice. Yet, further into the black below, at the inkiest recesses can be found the horrific ninth hell. Here dwells a deity of true evil, gloating over each corpse he’s claimed with macabre glee, and relishing the moment more of these lesser souls are his. 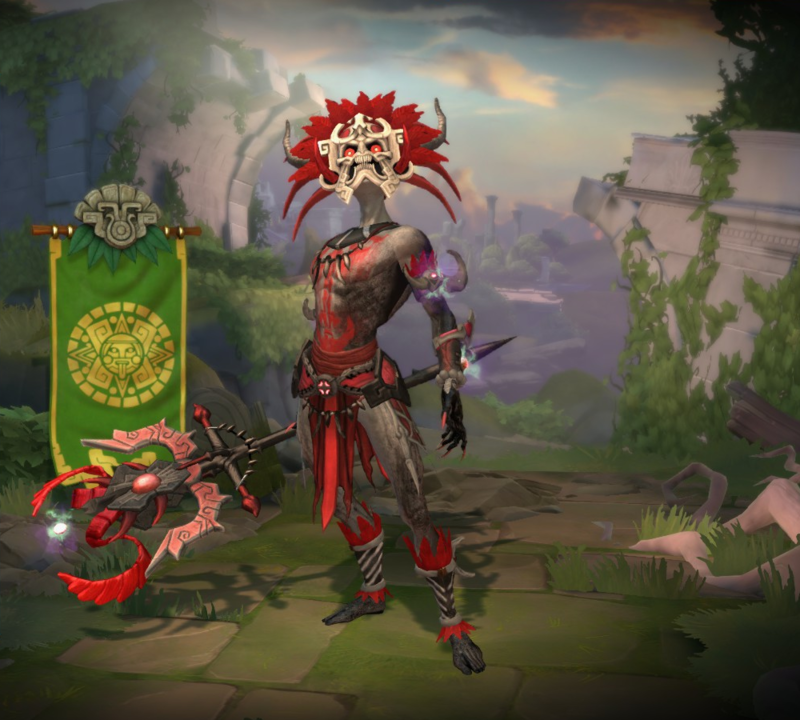 He is Ah Puch, the mightiest lord of the ninth hell. When night falls, Ah Puch roams the land, crowned by a wreath of human eyes, gruesome skull face bared for all to witness, accompanied by the shriek of ghostly owls. All that live are his for the taking. If Ah Puch finds a human in the night, he kills and drags the unfortunate into endless oblivion. Only those already wracked by his servants, those caught in gut-wrenching wailing, moans of agony, and fits of mania are safe from his touch. Hide now, all men and Gods, for the age of eternal night has come. Ah Puch will reap anything that lives. There is great vacancy left in the nine hells, and the Horrific God of Decay wishes only to fill it. Enemy gods can destroy the corpses with 2 Basic Attacks. Can deal up to 390/550/710/870/1030 (+160% of your magical power) damage with 6 corpses. The additional effect can also be triggered by percent Health Regeneration. Has a recovery time of .6s. The wraiths are projectiles that move in a straight line and go through everything. One of Ah Puch's taunts, "Even now, my minions march forth, claiming this world, in my name! ", is a reference to a quote made by Azmodan from Diablo III. One of Ah Puch's killstreak voicelines, "The dead do not suffer the living to pass! ", is a reference to a quote made by the King of the Dead in The Lord of the Rings. 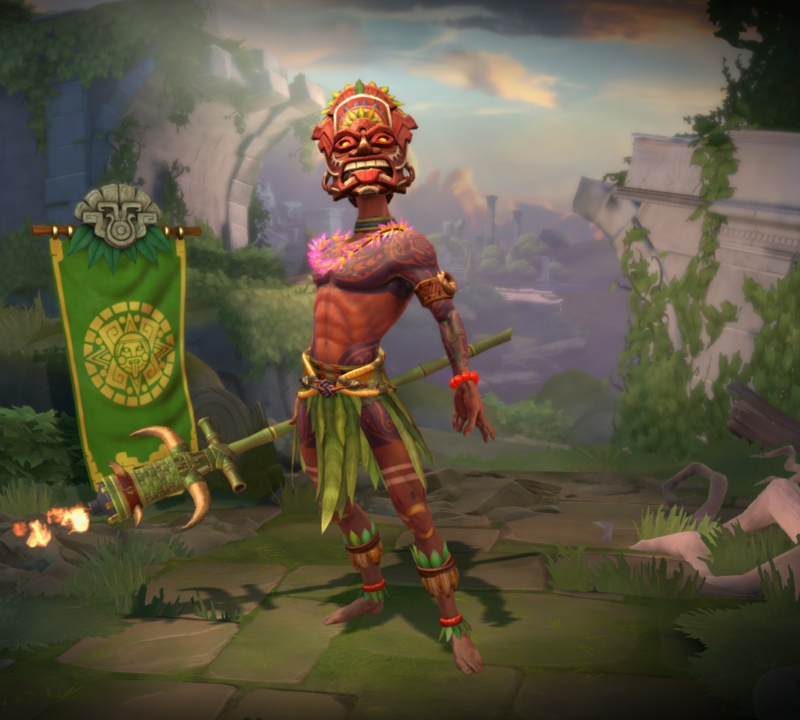 One of Ah Puch's taunts, "I will offer you a choice: Do you want an empty life, or a meaningful death? ", is a reference to a quote made by the Mandarin in Iron Man 3. This skin was based on the game Destroy All Humans!. One of the artist who worked on this skin posted an early version of this skin model that was unused due to look too close to it source material. His line for buying an offensive item "Ooh! Death ray! ...Why does it say 'ACME'?" is a reference to Marvin the Martian. His line for destroying a tower "All your base are belong to us!" is a reference to the game Zero Wing. His taunt line "Mars means war!" is a reference to the Roman counterpart of Ares Mars. His taunt line "Peace? No peace. ", is a reference to a quote in the film Independence Day. The Stargazer/Adjudicator Anubis skin also have a line refering to this quote. His direct taunt for Fenrir ""Ooh! The claws." is a reference to the Little Green Men from Toy Story 2. His direct taunt for Kali "You are one ugly mother." is a reference to a line from the movie Predator, althought this taunt is directed more to Trophy Hunter Kali. His direct taunt for Serqet ""I'll have to blast you from orbit. It's the only way to be sure." is a reference to the movie Alien, althought this taunt is directed more to Dread Queen Serqet. This skin is a reference to the Ballet play The Nutcracker. 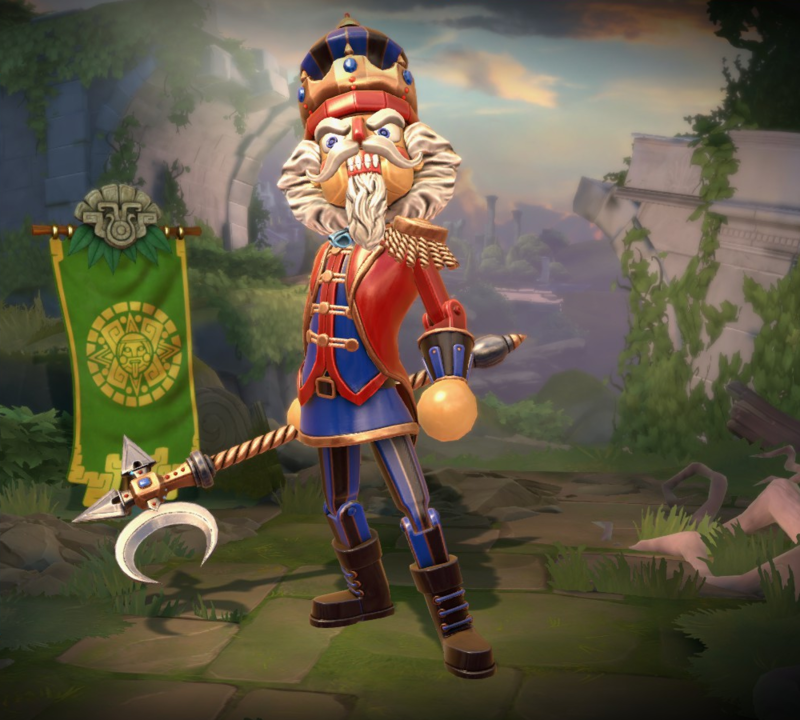 The actor who did the voice of this skin, Scott Frerichs, also voiced Chef's Special Khepri, Rock From Bisrakh Ravana and Earl Wubert St. Kongfrey Sun Wukong. 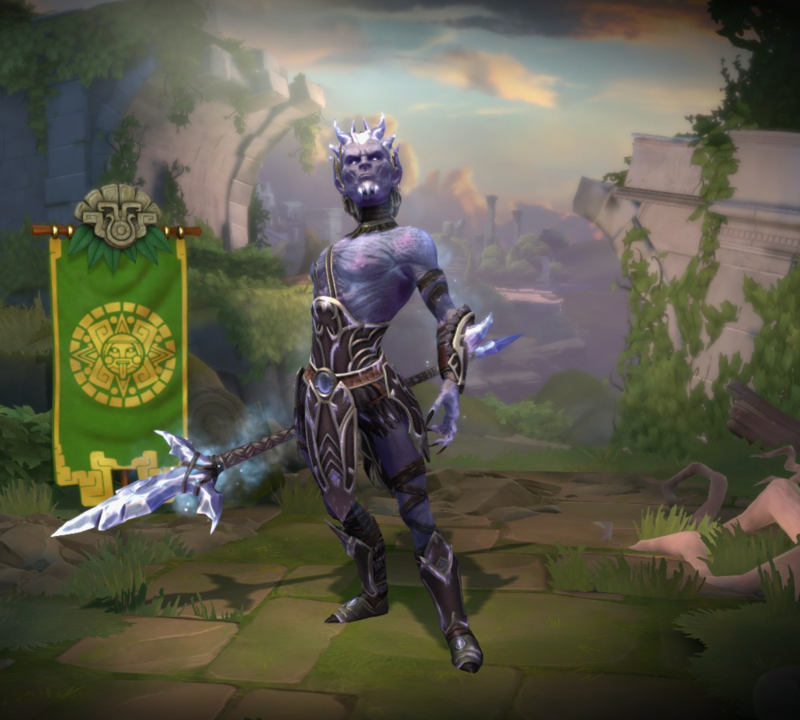 This skin is a reference to the Night's King from Game of Thrones. The voice actor who did the voice of this skin, Brandon Potter, also voiced Infiltrator/White Death Loki, Sobek, High Seas Sobek and G.I.Zhong Zhong Kui. This skin was part of the event Summer of Smite 2017. The actor who did the voice for this skin, Kellen Goff, also voiced Brimstone Cerberus, Inu Gami Fenrir and Jormungandr. This skin shares its theme with Riptide Poseidon and Fire Dancer Xbalanque. This skin was based on a forest spirit. This skin share its theme with Shadow Eater Bakasura and Shadow Stalker Izanami. The actor who voiced this skin, Patrick McAlister, also voiced Hachiman. This skin share it's theme with Infinite Shift Sun Wukong. 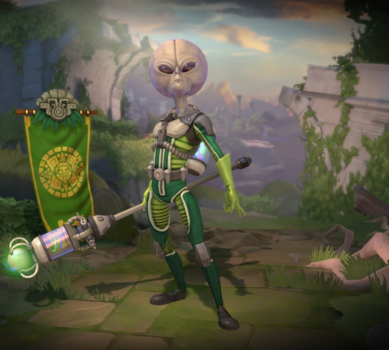 For a limited time, this skin also came with a free The Visitors ward skin. Decreased Slow Duration from 3s to 2s. Decreased Duration from 6s to 5s. Increased Cooldown from 12s to 14s. Decreased initial damage from 90/110/130/150/170 to 60/70/80/90/100. This change was in update 5.13 but was not included in update notes. Increased Cooldown from 90 to 100. Fixed an issue where his Ultimate was damaging structures. Increased Cooldown from 10 to 12. Increased Initial Damage from 60/70/80/90/100 to 90/100/110/120/130. Decreased Damage Per Corpse from 60/85/110/135/160 to 55/80/105/130/155. Increased Base Health from 375 → 400. Increased Health per Level from 70 → 75. Increased Base Movement Speed from 355 → 365. Mana Cost reduced from 70/80/90/100/110 → 70/75/80/85/90. Mana Cost reduced from 60/70/80/90/100 → 60/65/70/75/80. Mana Cost adjusted from 100/110/120/130/140 → 100 at all ranks. Reduced Casting Time from .5s → 0s. Increased Recovery Time from .1s → .6s. Increased number of corpses dropped from 1/1/1/2/2 → 1/1/2/2/2. Decreased duration from 5s → 4s. Increased damage per second from 25/28/31/34/37 → 30/35/40/45/50. Increased magical power scaling from 15% → 20% per tick. This ability no longer scales off of number of times healed. Increased additional damage on targets that healed from 20/30/40/50/60 + 10% per stack → 50/100/150/200/250 + 50% flat. Increased stun on targets that healed from 1s + .5s per stack → 1.5s flat. Now activates on all Abilities that have percent Health Regeneration. Fixed this skill dealing unintended damage. The bonus damage was counting an extra heal stack. No longer Slows enemies hit by Wraiths. Updated tooltip to say at ranks 1-3 this ability only spawns one decaying corpse. Updated targeter and FX radius to more closely match affected area. Now disappears when Ah Puch dies. Added Ah Puch Wave and Clap. Fixed emote VVGG ending abruptly. Updated accuracy on surging Corpses targeters. Ah Puch has been added to the game.